The Annual Awards Reception will be held Thursday, November 1st, 2018, from 6:30 to 10:30 pm at the University of Washington Botanic Gardens Center for Urban Horticulture in Seattle, WA. Reception Event tickets include dinner and one alcoholic beverage. Award of Excellence may be presented to a single entry in each category for a project that truly stands far and above all other entries and embodies the spirit and understanding that best reflects the Vision and Mission of ASLA. Honor Award is presented for superior professional accomplishment and a higher level of excellence recognized in the work presented. Merit Award is presented for superior professional accomplishment. Criteria: The jury will consider the quality of design and execution; design context; environmental sensitivity and sustainability; and design value to the client and to other designers. 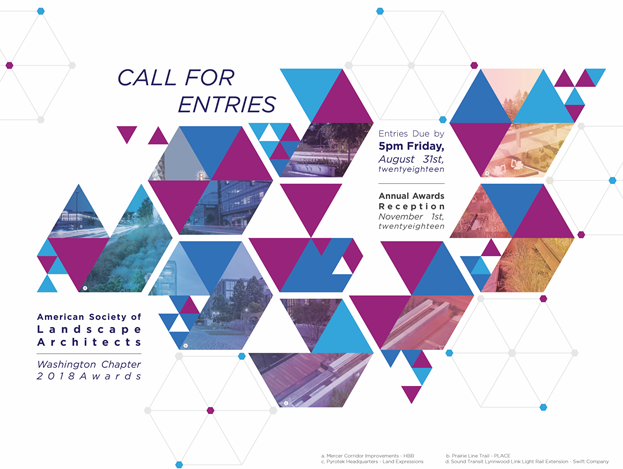 Typical Entries Include: Public landscapes of all kinds, such as parks, plazas, campuses, streetscapes, trails, historic preservation, reclamation, conservation; stormwater management, sustainable design; design for transportation or infrastructure; landscape art or installation; and more. Typical Entries Include: Private landscapes of all kinds (except residential); historic preservation, reclamation, conservation; green roofs and walls, stormwater management, sustainable design; design for transportation or infrastructure; landscape art or installation; interior landscape design; and more. Recognizes: Built, site-specific works of landscape architectural design for residential use. Typical Entries Include: Single or multi-family residential projects; activity areas for cooking, entertaining, recreation or relaxation; sustainable landscape applications; new construction or renovation projects; historic preservation, rehabilitation, or restoration; affordable landscape concepts and innovations; rooftop gardens; and more. Recognizes: The wide variety of professional activities that lead to, guide, or evaluate landscape architecture design and/or works that investigate challenges posed in landscape architecture, providing results that advance the body of knowledge for the profession. Entries in this category are not required to be built or implemented. Criteria: The jury will consider the quality of the research, analysis and/or planning effort; context; environmental sensitivity and sustainability; likelihood of successful implementation; the clarity and importance of research question, hypotheses, or goals; significance of historical data, where relevant, and links to current knowledge; appropriate research design and use of rigorous methods of inquiry; the clarity of presentation of outcome; the outcome’s potential application to practice, and the value to the intended audience. Typical Entries Include: Urban, suburban, rural, or regional planning efforts; development guidelines; transportation, town or campus planning; plans for recovery or reclamation of brownfield sites; environmental planning in relation to legislative or policy initiatives or regulatory controls; cultural and natural resource protection; historic preservation planning; interpretive design; exhibition design; investigations into methods, techniques, or materials related to landscape architecture practice; studies of relationships of landscape architecture to law, education, public health and safety, or public policy; and more. Recognizes:An individual landscape architect, group of landscape architects, landscape architecture firm, or landscape architecture education program who has provided sustained service to the community demonstrating sound principles or values of landscape architecture, or who have developed a working partnership with a community organization to enhance the community and advance the presence of landscape architecture, or who have made significant contributions to the profession and/or to the Washington Chapter of ASLA. Criteria:The jury will consider the nominee’s sustained value to the community they/it serves and the quality and sustainability of the partnership between the landscape architect/firm/program with the community organization(s); the nominee must be in good standing with WASLA. Typical Entrants include:Local leaders that have established, strong partnerships with local or regional community organizations; landscape architects that have served in a leadership capacity in the local chapter, furthering the mission of ASLA and the profession; or local firms that have partnered with an organization that has impacted the local community in a meaningful way. Recognizes: An individual showing promise of making contributions to the profession of landscape architecture through exceptional leadership, design, communication, service, and/or vision. ASLA Washington Chapter involvement, participation, and Board of Directors position(s) will be considered. Criteria: Nominee must be an emerging professional in their first five years of practice that exceeds expectations and shows promise in making contributions to landscape architecture. Typical Qualities Include: Demonstrated leadership, design excellence, fluency with clients, community engagement, and service to the profession. Project must be completed by an ASLA Fellow, ASLA Full Member, or ASLA Associate Member; or eligible to join ASLA in one of those categories. An official nominee in the Community Stewardship and/or Outstanding Emerging Professional category is not required to join ASLA to enter. While location of the project can be nationwide, the design work must be substantially completed by licensed individuals or firms with a work address within the state of Washington. The project must not have previously won a WASLA award. The project must meet all requirements set forth in this Call for Entries. The Jury will be comprised of an out-of-state group that represents the breadth of the profession, including private, public, institutional, and academic practice, and exemplify diversity in professional experience, geography, gender, and ethnicity. The jury awards will be by majority vote and not by full consensus. The jury process is blind, the identities of the entrant and creative team are not revealed to the jury. Members of the professional awards jury, as well as the firms, organizations, agencies, or employers they represent, are not eligible to enter the professional awards program. WASLA retains the right to disqualify any entry that does not meet the program requirements or that presents a conflict of interest. Project Statement: In 175 words or less, describe the project and why it’s award-worthy. This statement may be used in promotional materials if the project is selected for an award. NOTE: failure to submit this statement will lead to disqualification of entry. Project Images: Project images must include at least one (1) site plan and five (5) but no more than fifteen (15) total drawings and/or photographs in a single PDF file not to exceed 15 MB and 15 pages. Format of the file to be 11”x17”, landscape. Brief caption of no more than 40 words each is to be placed at the bottom of each image. We highly recommend using just one image per slide with a simple caption. Label the PDF file with the project Title (do not label using your name). NOTE: failure to submit images/drawings will lead to disqualification of entry. Entrants are responsible for gaining rights to photographs for publication and reproduction by WASLA. WASLA will provide photography and other project credits when using photos, but will not assume responsibility for any copyrights or photography fees. WASLA retains the right to publish photos submitted in winning entries on the WASLA website, in promoting the awards program, and in other products in conjunction with promoting landscape architecture. The PDF files will be utilized to present your project at the Awards Reception. Project Narrative: Describe in 1200 words or less how the project addresses each component of the category’s criteria. Entry Form: Download the entry form. This form will be used in the judging process to ensure the jury is blind to the identities of the entrants. A letter of nomination describing the nominee's qualifications for the medal; the letter may be no more than five (5) pages in length. Include three (3) to four (4) images representing the nominee’s work (in high resolution, .jpg format). Project images should be at least 2000x1500px at 300ppi (pixels / inch). Letter should respond directly to award category criteria. A minimum of one (1), and up to five (5) letters of endorsement. Unless the applicant is self-nominating, provide a PDF of either an email or dated letter of acknowledgment from the nominee that they accept the nomination. Complete submissions are due by 5pm Friday August 31st, 2018. Late entries will not be accepted. Winners will not be notified in advance of the Reception.